You may have heard the saying: Plug a $5,000 guitar into a cheap amp and it will sound tiny and thin. Plug a cheap guitar into a great amp, you’ll still get great tone. While this might be an accepted wisdom, the trend continues to be extravagantly spending on a beautiful guitar, but the amp? How much spare change do I have left? The reasons why amps are sometimes neglected in a place like Singapore are compelling – the noise disturbs the neighbours, it’s just for practice in my bedroom etc etc. But the truth is, great tone can be truly inspiring, so you shouldn’t sacrifice it just because you’re practising in your bedroom. You can get great tone at lower volumes, and it doesn’t have to cost an arm to achieve. Like many musicians, we’re in the pursuit of sounding as best as we can. Amps play a huge part in your guitar tone, so we’re going to give a quick, simple rundown on the types of amps and which will serve you best. Tube amps are arguably the holy grail of guitar amplification. They are responsible for the sounds heard on records since the inception of electric instruments. They’re the first choice for professionals, even today. 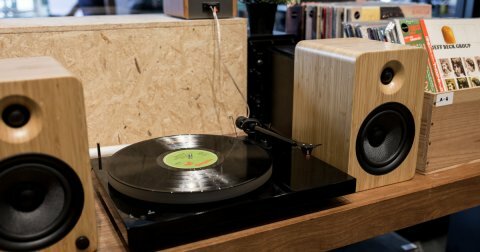 Tube (sometimes called valve) technology is ancient by today’s standards, but they show no signs of fading away in the world of amplification. The reason for their timelessness in amplification is simple – tone. The tubes in a tube amplifier create a tone that is impossible to recreate. Harmonically rich, crystalline, organic, are just some adjectives used to describe their sound. Where tube amps really shine though, is when the tubes are forced to work harder when you crank the volume or gain. The signal clips in a very natural way, resulting in an overdrive tone that is extremely desirable and sought after. Tube amps also respond in a way solid-state amps cannot. Every nuance, light or hard touches, are translated faithfully and yield different tones. The downside? Their biggest strength can sometimes be their weakness – tube amps sound their best when cranked loud, not at lower, bedroom friendly volumes. Tube amps require more maintenance than their solid-state counterparts and are also more expensive. This is tube tone at its purest. 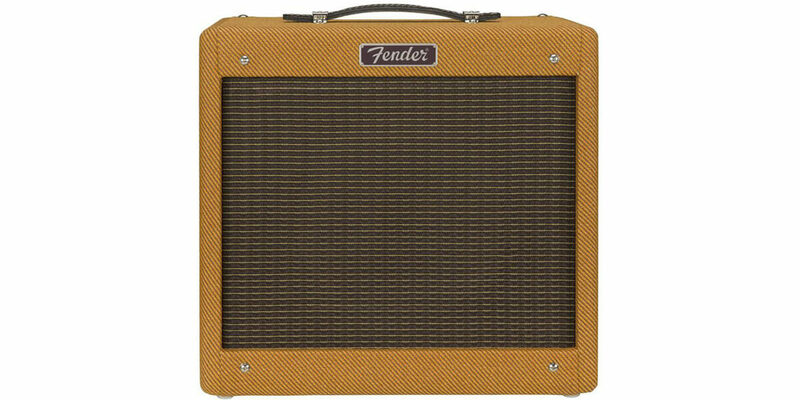 Powered by two EL84 power tubes and two 12AX7 preamp tubes, the Fender Pro Junior is a classic that’s perfect for the bedroom and even a small gig. Styled after the 50s Tweed combos, the Pro Junior harks back to a golden era with its period correct Fender logo and tolex. Don’t be fooled by its size and simplistic volume and tone controls. Voiced with 10” Jensen speaker, The Pro Junior packs a punch even at lower volumes. And if you do crank it, expect fat and rich overdriven tones. Tube amps can be deceptive in the power department. Small amps with as little as 4W are not uncommon (the Pro Junior is only 15W). Compared to their solid-state cousins, they can seem underpowered. But in the tube amp world, a 15W amp is almost always much louder and more powerful compared to a solid-state equivalent. If you do need more power for medium-sized gigs, or more headroom for louder cleans, you might need an amp with more wattage. 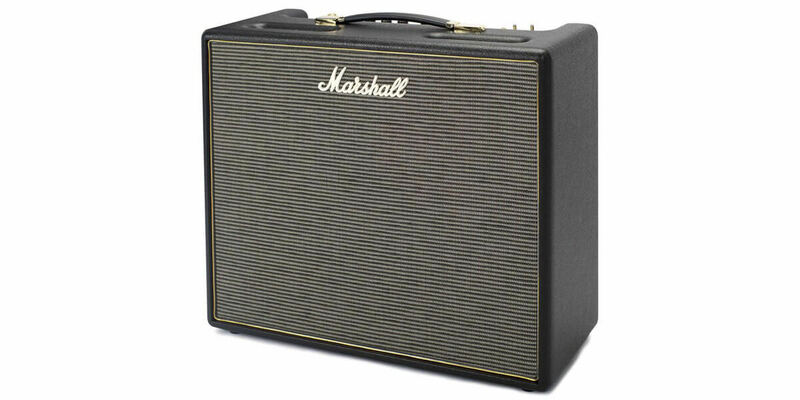 The Marshall Origin 50W combo does the job perfectly at incredible value for money. At 50W and fitted with a 12″ Celestion speaker, The Origin 50 is built to faithfully recreate the tone and feel of the classic Marshalls of yesteryear. 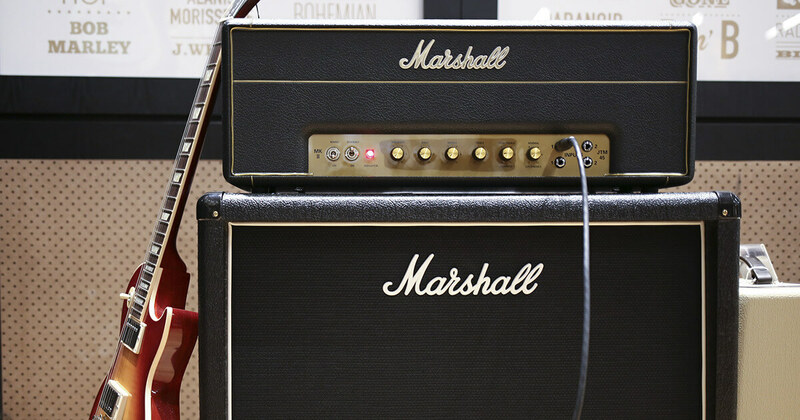 But it’s not all vintage styling – Marshall has incorporated modern features to match the needs of the contemporary player. Most notably, its Powerstem feature allows you to have high or low power modes without compromising on sound quality. 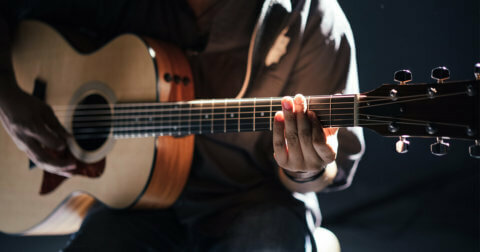 This means optimal tone even when jamming at lower, bedroom-friendly volumes. There’s also a tilt control, which emulates the blended sound of the bright and normal channels of the 1959 Super Lead Plexi and JTM45, in a single knob. Solid-state amps have been somewhat cast into the realm of beginner amps or starter pack material. But you’ll be surprised to know that professionals have used solid-state amps as their workhorse amp both in the studio and on stage. Dimebag Darrel achieved legendary metal tones with his solid-state Randall head. 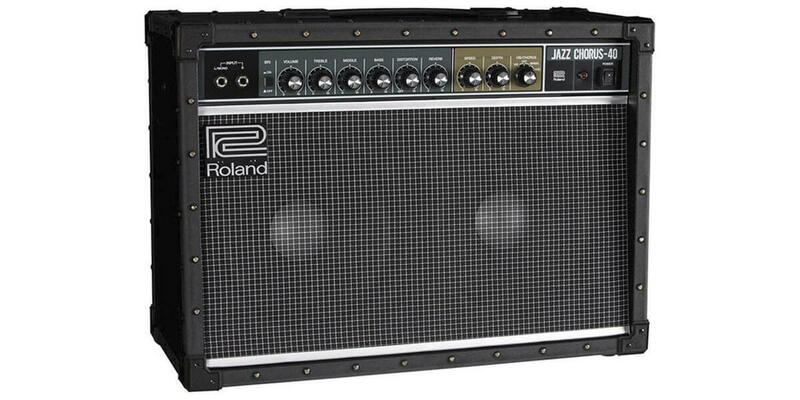 Andy Summers of the Police, known for his chorus-ed cleans, recorded and performed with the esteemed Roland JC-120. Modern solid-state amps have improved tremendously alongside technology. The old buzzing solid-state amps of decades past shouldn’t be the archetype when it comes to solid-state amps. A scaled-down version of the legendary JC-120, the JC-40 produces the same lip-licking clean tones of its bigger brother. It also brings a number of modern updates based on the needs of players who have trusted the JC120 for decades. The amp has always been a hit among keyboardists so Roland has included a front-panel stereo input for their stereo rigs. The famous Dimensional Space Chorus and vibrato has been upgraded and updated for a wider tonal range and deep stereo sounds. At $899, this is tube amp territory. But those who are serious about their tone and know exactly what they want – incredibly lush cleans and an unrivalled chorus effect – can justify the price tag. The JC40 is a perfect stalwart for solid-state amps. Imagine being able to switch from a Fender Blackface style clean to a roaring Marshall Plexi at a twist of a knob. That is what modelling amplifiers aim to accomplish, in theory. Of course, they’re not going to replace the real deal completely, but as technology forges ahead, so have the tones these amplifiers produce. As their name suggests, modelling amps use digital technology instead of tubes or transistors for their sound. They are great for guitarists who want a wide range of amplifier sounds and effects to work with. They can be tricky to dial in, but you’ll be rewarded when you do. They’re also usually available in smaller packages and are designed to sound great at any volume. Features like onboard effects are nice to have if you don’t want to connect your pedalboard, but sometimes the simplest configurations will work too. 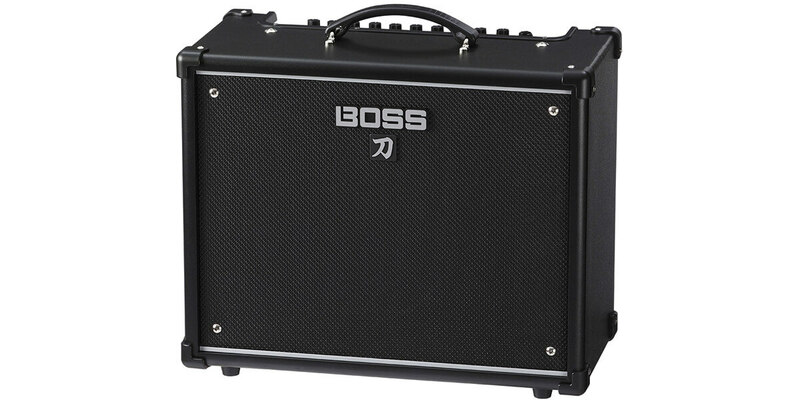 The BOSS Katana 50 is a popular modelling amp with an impressive CV. You get to pick from five distinct amp “characters”, from acoustic to chiming clean tones to high-gain metal chugging. There are 55 BOSS effects to pick from, and you can load up to 15 of them for instant access. If that’s not enough, you can hook the amp up to the BOSS Tone Studio editor software to further customise your effects and amp settings. For great sound at lower volumes, the Variable Power Control which drops the power to 0.5W for optimal sound in your bedroom. We’ve only just scratched the surface of the world of guitar amplifiers. It’s a long but enjoyable journey learning about amplification and your ideal tone. The best way to find your perfect amp it to try them out for yourself. Bring your guitar down to our flagship store at The Star Vista and give these amps an audition. There are a wide selection of amps available, from modelling amps to tube combos and head and cabinet combinations. Take your time and enjoy the tone these beasts have to offer.